Today’s 24 afterthoughts are dedicated to Aaron Pierce, as Lrudlrick put it, the Danny Glover of the Secret Service. Aaron’s expression as he’s drove off with the wounded Wayne was classic. Oh, and can someone tell me where and how Wayne obtained the scope gun? Even the writers felt plausibility of Wayne taking down a special ops person was slim and saved us from a visual. Lesson #82: When Chloe is nice to someone, that person has issues. Nice and Easy Girl sure isn’t nice and easy. She’s more Anti-Touchy Feely Girl. The girl needs to spend some time on a NYC Subway and rethink her personal space standards. Oh and anyone who thought for a moment Miles the Smiles was sexually harassing Nice and Easy needs to check their gaydar. I hate him and his high pitched smarminess but he isn’t the sexual harassment type. He’s a slithering snake but he’s no dirty old man. I must say, I’m liking Julian Sand’s new do. It suits him well. Julian, no more long straggly Draco Malfoy hair. Stick with the short crop. Audrey. Man, I thought I’d enjoy the torture more but I just felt bad. You have the wounded kitty look down to a science. 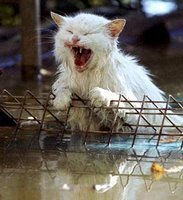 With the stringy sweat drenched hair, you looked like a wet cat. Plus, I don’t know about you but if I was tortured with chemical agents because of a man who put me here in the first place, I wouldn’t be all dreamy eyed about him rescuing me. Sure it’s Keifer but I think sucking face would be the last thing I’d want to do after being injected with pain inducing drugs. Someone get the Gas Man a new pair of pants. Mr. Supervisor, by the grace of Julian Sand’s schnoz and fire extinguisher Model #FH223M you weren’t killed. Consider yourself one of the lucky and few. Thanks go to Blogs4Bauer for mentioning the fire extinguisher's demise and posting its id card. Lrudlrick and I laughed for a solid 5 minutes as it hissed it's last hiss. Nice. If you can’t stop the toxic gas, blow up the entire natural gas plant that’s holding the Sentox. I guess that sounds like a good idea. I’m not sure what the environmental people think of that plan but I enjoyed the giant Roman candle. Speaking of bombs, do all agents carry exploding SD cards and timer bombs? Keifer has more stuff in his canvas European carry-all than Mary Poppins carries in her carpet bag. Anyone else laugh when Buchanan and Black Jack stated matter-of-factly, “He’s going in.” Hells yes, he’s going in. 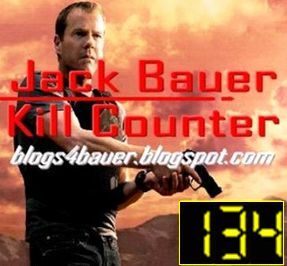 He’s Jack Bauer. The man doesn’t sit idle. Lrudlrick points out Black Jack had the classic ‘Jack is one crazy white man’ look that everyone does at least once during an encounter with Jack. You have to give Bauer credit though. He has incredible work ethics. He’s not currently employed at CTU. Heck, who knows if he’s got any health insurance yet he doesn’t think twice about running into what is essentially a powder room that Bugs Bunny just threw a match into. Now, I’m not jinxing anything but the only way Jack survives that blast was if the cop car has an underground panel. That or he hid himself under Julian Sand’s schnoz. Kudos to everyone who though FLOTUS' crazy assistant was the weakest link. I’m not saying she’s the mastermind but I will say she’s not the brightest bulb. She’s the girl that goes to Ecuador and thinks it’s ok to swap luggage with a complete stranger she met 2 days ago. Finally on a non-related ‘24’ note but continuing on the topic of hair, what the hell is wrong with Ernie Anastos’ hair Monday? It was like a mini pompadour. What were the stylists thinking? Let’s give him a waxy glow and a pompadour. Watching the news preview I thought I was watching a simulated broadcast from Madame Tussaud’s Wax Museum.